Back around 2006 I produced a series of podcasts about parrots. I would interview various people in the parrot world and post the podcasts on a special website. Most of those podcasts are just as relevant today as they were ten years ago, so I'm going to post one every once in awhile. 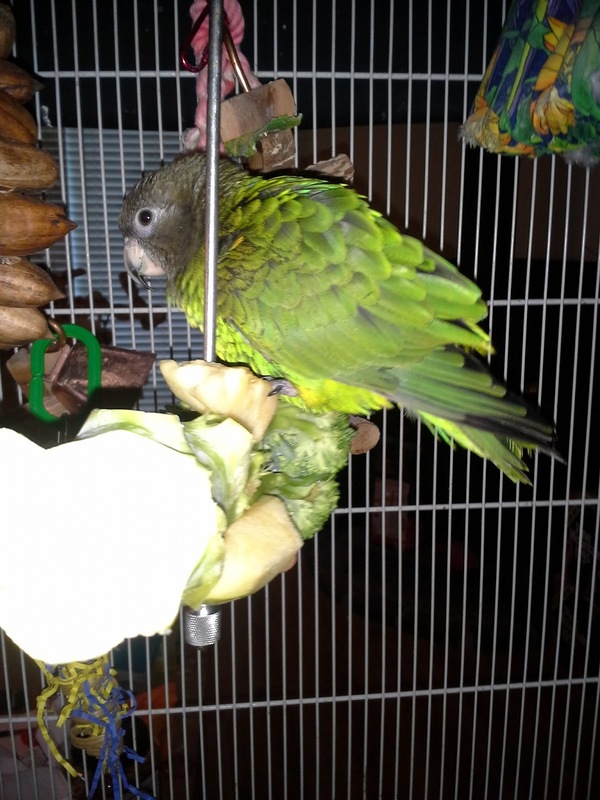 The one I'm posting today is with Mattie Sue Athan, author of the best-selling Guide to a Well-Behaved Parrot. We had a fascinating discussion about encouraging independence in our parrots. PS: Mention is made of the website Scritches.com; that site has changed its purpose since then. The e-mail mentioned at the end of the podcast no longer exists. The store was having a big sale on fresh organic broccoli; the kind of broccoli that comes on those huge stalks. 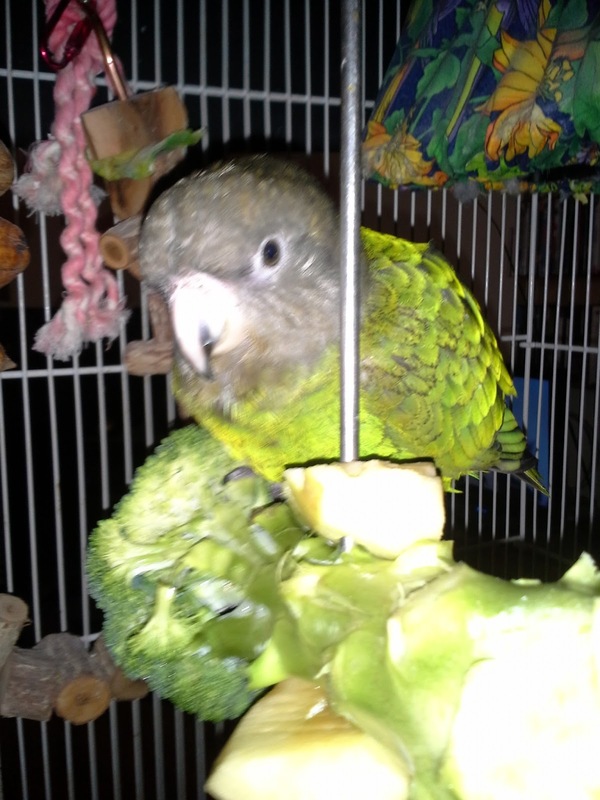 I personally like raw broccoli and all my birdies like raw broccoli, so I try to keep some in the house, when I think of it. I couldn't pass up this deal, so I came home with two huge stalks of broccoli and some organic apples. Now Charli loves "helping" me work on the computer, even going so far as to attack my fingers for not giving her scritches, as is her due. Anything that can keep Charli busy while I'm working is a good thing, and one of these stalks was a very good thing. This is the simplest of foraging toys. 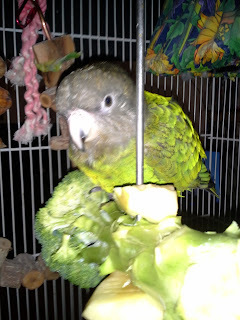 A bit of apple around both ends of the broccoli. 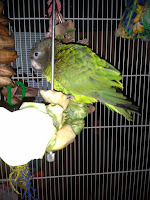 Charli not only enjoys eating apples and broccoli, I think she loves the chomping and dropping from the beak even more. Since she's in her cage, I don't mind a bit how much of a mess she makes. I hope you can tell from the pictures that the stalk of broccoli is longer than she is. If I'm lucky this will keep her busy all morning and then encourage her to take a little nap before deciding she must get out and "help" me! A frightened phone peeks out from its protective cover. Charli hates the phone. Whenever I have to use it she becomes enraged at the attention I seem forced to give it, rather than giving my attention to her. Sometimes she'll bite me if I'm on the phone too long. I like to think she bites me to make me move away from the Evil Phone lest it eat me up altogether. Of course, that's a prime example of anthropomorphism -- in reality she's just jealous. 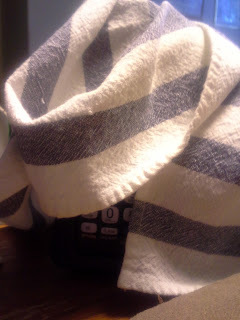 When I'm finished with the phone, I place it back in its cradle and then cover the unit with a dish towel. My theory was that if Charli can't see it she won't attack it. This worked well for a few months, but now Charli delights in pulling off the dish towel and attacking the defenseless phone. Some parrot-crazed person somewhere wrote in some parrot publication that she'd begun treating her phone like a "bad" bird. She would shake her finger and scold it while her parrot looked on. Naturally, as soon as I remembered this I tried it. If it worked for her, surely it would work for me, too. When I would finish a call, I began putting the phone in the cradle and then shaking my finger at it. "Bad phone!" I would say. "Bad, bad phone!" Charli would always watch this with great interest. "I'm going to cover you up," I continued, "so you can think about what you've done!" Then I would drape the dish towel over the phone, frowning through the entire process. Has it helped ease Charli's jealousy? Not really. After several weeks of "punishing" the "bad, bad" phone, Charli remains unfooled. She also takes spells where she attacks the computer keyboard, especially if my fingers are "playing" with it. All parrots know that fingers are to only play with parrot feathers and nothing else, and all parrot slaves should know that, too. Is your parrot jealous of the telephone or the computer.? Or both? Have you been able to solve the issues? Please tell us how! My poor phone is beginning to have an inferiority complex. Charli grabs a tissue to deal with her allergies. Several months ago, back in the spring, I noticed a slight congested sound from Charli when she was on my shoulder. Not all the time, certainly not loud, but it was definite congestion. Her nares were clear, and her behavior was in all other ways normal. I figured I was imagining things. The next evening I heard it again, and it was not my imagination. She also sneezed a couple of times. I immediately called a new (to me and Charli) avian veterinarian for an appointment, up in southern Ohio. Charli was well-behaved during the exam by a stranger, though she did not appreciate having said stranger peer down her throat. She also didn't appreciate the stranger taking blood, but she didn't care that he also took a bit of her discarded poop. The results? 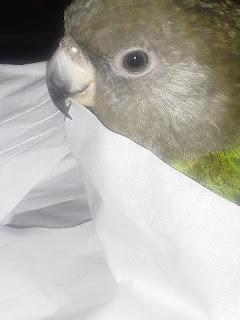 All the results were normal for an extremely healthy well cared for parrot who just happened to have seasonal allergies. Oh yes, the vet explained. They're quite common. You know we're right in the middle of the Ohio Valley, and all the allergens settle around here. It was true that our region of the US has had the highest rate of allergy sufferers for years. From about April to November allergy treatments and medications get added to my regular every day vitamin regime, so I am well-acquainted with allergies. So now my sweet little Charli had allergies, too. What could I do for her? The veterinarian gave her an injection of antihistimines and said that would help. If not, he said, we could try various drugs that were used to treat allergies in parrots. This vet was so good that he gave Charli the injection before she realized she'd been stuck. She turned her head to bite him, but it was already over. After about a week, there was still some congestion. It ended up with the vet sending me a medication to give Charli by mouth, which was so much fun I can't begin to talk about it yet. But the good news is that she is evidently only allergic to spring time allergies and not summer or autumn ones. I'll take what good news I can get. Are your parrots allergic to things? How did you find out?